A man who placed bacon on the doors of a Bristol mosque has died in prison while serving a 12-month sentence. 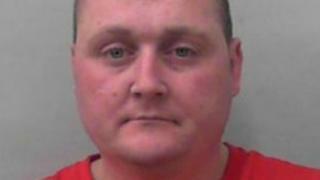 Kevin Crehan was sentenced at Bristol Crown Court in July for racially-aggravated public disorder. Rashers of bacon were placed on the door handles of the Jamia mosque in Totterdown in January. A prison service spokesperson confirmed the 35-year-old's death on Tuesday at HMP Bristol and said an independent investigation was under way. Three other people also admitted taking part in the incident in January where a member of staff was also racially abused. Crehan, 34, of Knowle, was jailed for 12 months and Mark Bennett, 48, of Patchway, for nine months. Alison Bennett, 46, the wife of Mark Bennett, was given a six-month sentence, suspended for two years. Angelina Swales, 31, from Brislington, was handed a four-month sentence, suspended for two years. The prison service has declined to give any further details of the circumstances of his death.